So I'm trying to post a couple of 'healthier' recipes since I've noticed most of my posts tend to not be very health conscious. Jenn and I try to eat salads as often as possible but I only have a few different ones that we eat often so I'll have to start experimenting a little to find some new options to post. I love my Trader Joe's spicy pecans and Gorgonzola cheese so those tend to be in most of my salads. I also try to include some sort of fruit or berries. 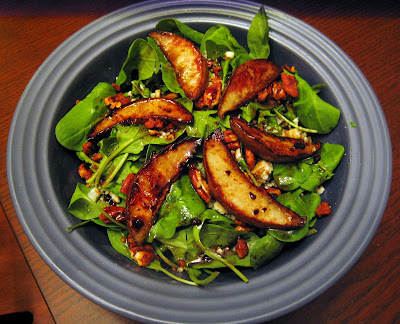 This one uses baby arugula greens, the nuts and cheese and warm pears sauteed in a little butter and brown sugar. I love arugula but it's pretty bitter so I like to have something sweet to balance it out. I serve it with homemade balsamic vinaigrette and people seem to like it so far! What a nice combo! Using cooked pear in your salad. Absolutely delicious!